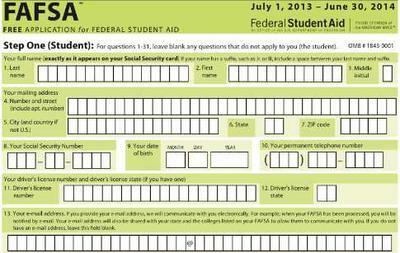 The FAFSA Application is one of the most important forms that a college student will fill out. This form determines how much federal aid a student will receive, and may also determine how much aid a college will give a student. The key to getting as much money as you possibly can is to apply for the FASFA as soon as you can. The earlier the form is submitted the more money you are able to receive. Two things that a person needs to be aware of during this process is verification and FAFSA deadlines. Verification is a process that a handful of students go through when they submit the FASFA. If this happens to you, don’t freak out, this isn’t a bad thing, just make sure you get it done as soon as possible. It is also extremely important to be aware of deadlines, don’t submit your FASFA in at the last minute because you will risk not getting any federal aid. If you have any questions during the process of applying for the FASFA, make sure to ask a guidance counselor or financial aid advisor. I learned this the hard way. I had submitted my FASFA and was waiting to hear from the university I was planning to attend about my financial aid. I called them about two weeks away from the FASFA deadline and discovered that I didn’t complete a step on the FASFA. Needless to say, although I was able to correct my mistake I wasn’t awarded enough money to make it possible for me to attend that university. I was able to go to a local community college though. Throughout that experience I have learned to ask questions if I don’t understand something or if something doesn’t look right. Your FASFA is usually processed pretty quickly, so if you haven’t heard anything about your application you should call your university and see if something is wrong. It is very important to keep tabs on your application if you want to be awarded the aid you qualify for. Now that I am transferring to a university, I learned my lesson and my FASFA application process ran smoothly. Thank you Jessica for reminding students to check your FAFSA application status. This is easy to do online. There are many things that could hold it up so you want to be sure to check for any errors and verify with the financial aid office that they have received the FAFSA and any other required documents. Best of luck to you in college. where I wanted to get. Then I found out how long it would take to get there. Then I learned that to get there it was going to take a lot of money. I thought even a part time job and the help from my parents wouldn’t cut it. I was really unsure of how my life would become. Then my teacher assistant came and pulled me aside and I told her my issues. She said she had the same thoughts when she graduated but she looked for help. She told me she could help me find some alternatives. So we went to the school counselor and she asked me what I wanted to be she took all the information I gave her and mapped out my next 6 years. She showed me what classes I needed and how to get there. I went to Grossmont online classes and started my road to success. But I still had the money problem; she told me that there were a lot of programs to help with that. Then finally she showed me this FAFSA program. When applying for my Free Application for Federal Student Aid I applied with a high school counselor. She came to me and said there are ways to get help to pay for college. I told her my story and how I couldn’t pay my way through college on my own. She told me it was okay and that she would show me a way to help me. So the next day she invited me to the computer and introduced me to FAFSA. I liked it immediately because of the easy steps it took to get covered. When applying for FAFSA we went to the online application and applied online. It was easy it asked me some questions just like an application. But this application was the best one I applied for being that is going to help me. The application even put in the draft card for me all I had to do was check a little box. This program was to be done every semester so pretty much twice a year. My first thought was does every student know about this because they should. She said that a lot of kids did and that wasn’t the end to scholarships. People apply to scholarships everyday to get covered and get through school. Lastly this program is very efficient and is very good that it is around. I am happy that I learned about this program so early in my college road to success. Thank you Abdullahi for sharing your story about FAFSA college road to success. The FAFSA or Free Application for Federal Student Aid is the best way to get financial aid for college, including scholarships, grants, work-study and federal loans. Good luck to you.